Most people probably didn’t notice any of this because the focus in that moment for the audience is on the encounter between Kylo Ren and Luke Skywalker. You’re so focused on what’s going to happen you don’t notice the details, which is, of course, the point. However, when watching Star Wars: The Last Jedi again, something which is now easy since the film is available in both Digital HD and Blu-ray formats, you can now go back and see what you missed. Of course, you can look at these moments as hints of the reality of the situation, but they’re also necessary for film continuity. 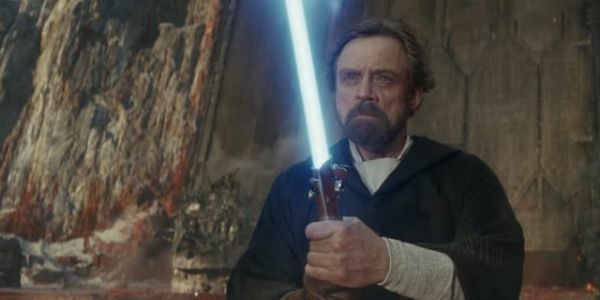 If Luke actually had bits of floating salt sticking to his robe, fans would be nitpicking that after the fact once it was discovered that they shouldn’t be, since he’s just a projection and not the real thing. Many fans were already frustrated by the entire concept of Force Projection, due to it being an ability never seen on screen before. Certainly, if there were continuity errors in addition, they would have been really upset. I certainly didn’t notice anything that hinted at the eventual reveal, being too overwhelmed by everything else that was happening. Although to her credit, my wife did notice that Luke Skywalker didn’t leave footprints, though, at the time, she assumed the movie was implying that Luke was such a well-trained fighter that he was so light on his feet that he didn’t leave tracks. A theory which seemed to be accurate moments later when Luke dodged Kylo Ren’s swings with perfect agility. Instead, we learn that Luke’s real power comes from a mastery of the Force that allows him to cross galaxies.